I know I am a little late on this one by a couple of weeks but lets blame that on Disney World as we were vacationing there, then we were going nonstop! Anyway I am in awe when I think about the fact that I am a mother to a ONE year old! She is absolutely incredible and I feel she is going to walk unassisted anytime now! She grabs her push walker and walks all around the house with it and steers it to wherever she wants to go. Also she is getting more and more curious when we are out for our walks as she would rather walk around holding someone's hand rather than being pushed around in her stroller. Eloise is babbling so much now! She really wants to communicate. And she does a decent job of communicating whether its pointing to what she wants, to bringing me to it etc. She repeats back some words and phrases in both french and english. She currently has 8 teeth and 2 more are on their way. It doesn't seem to be effecting her nightly sleep but its getting increasingly more difficult to get her to go down for a nap. I am still breastfeeding surprisingly! Before giving birth, breastfeeding was something I was most worried about however I am absolutely ecstatic that I have had this amazing opportunity to continue this journey. With her interest in food peeking, however; she has started weening herself off... But there are still moments throughout the day where all she wants is her momma and some breastmilk. Something I have noticed recently is Eloise will put things back. For example, the balls back in the ball pit or her toys in her toy box! I wasn't even expecting that but I guess she is mimicking us! Speaking of toys, she loves the water so my mother-in-law got her a water table which she cant get enough of. She also enjoys going swimming! She is gonna be a fish just like her momma. 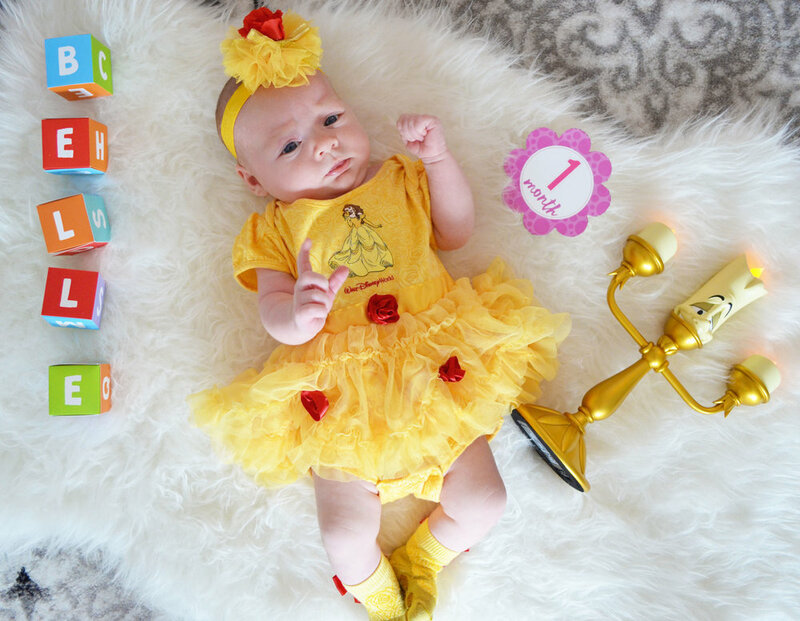 For this photoshoot I thought it would be fun to duplicate her one month photoshoot! If you wanted a refresh on her one month shoot click here. Has she ever grown! 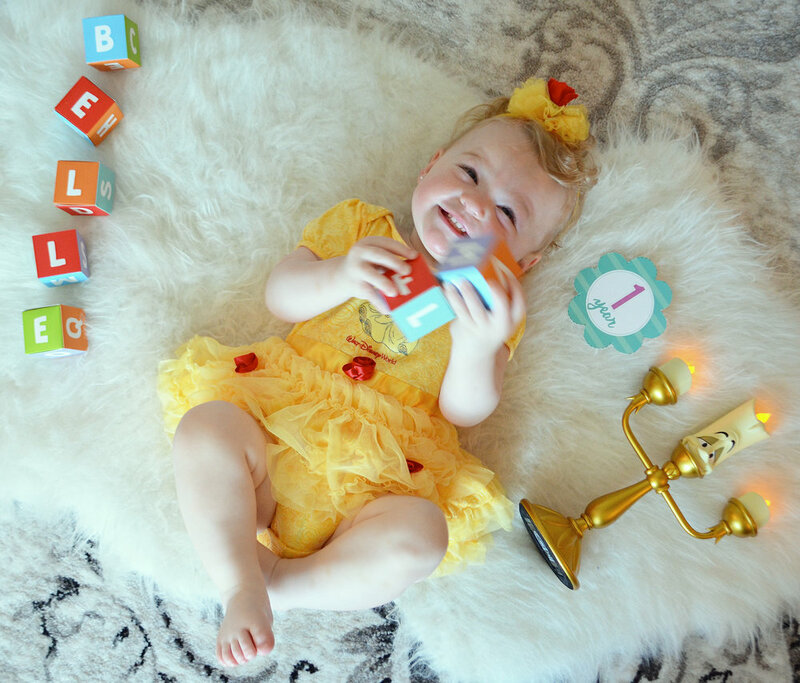 Belle Eloise showed her smiles more than ever today :) Check out her ONE YEAR photos down below.